725 S. Willson Avenue – From the moment you walk up the steps leading to the welcoming veranda and custom front door of this magnificent home built for E.W. King, you sense you are entering Bozeman’s rich history, lovingly preserved and very much revered. Since 1906, this impressive home, occupying the prime corner of Willson Avenue and College Street, has been considered one of the Bon Ton Historic Districtâ€™s finest mansions. The architecture is a blending of Queen Anne and Colonial Revival styles, taken from an architectural pattern book compiled by Keith Company Architects of Minneapolis. At the turn of the 1900s, it was common for affluent people living in more remote locations to rely on publications such Keith Company Architects to help guide their local builder. The home was constructed by R.J. Scahill, a Bozeman builder who also built the neighboring Story Mansion. Mr. King, the owner, epitomized the American Dream, and was a man of considerable skills, talents, and political influence. After moving his wife and family from Minnesota in the late 1880s to Great Falls, he designed and installed the municipal water and sewer systems for Great Falls, along with designing public parks, then went on to make a fortune in mining. He decided to move to Bozeman in 1903, became a banker and politician, and by 1906 he began work on this home, which has had 4 owners over the past 110 years. Each of the 4 owners have honored the design and integrity of the home and thus many of the original fixtures, wall papers, windows, and wood work appear new and untarnished by age. Mr. King understood what was involved in creating and constructing a timeless masterpiece. He began by purchasing 4 choice city lots so that his home would have room to breathe and he could surround it with perennial beds. Next, he saw to it that the foundation is solid, and to this day, the basement is dry and able to be finished into living space should someone wish to do that. 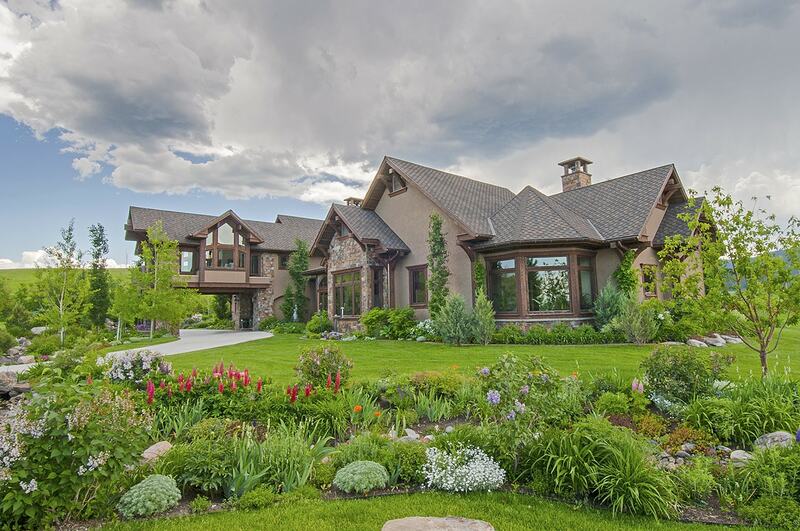 Bozemanâ€™s finest craftsmen worked for 2 years on the intricate tiger oak and maple woodwork that includes ionic pillars, intricate crown moldings, wooden arches, doors, boxed beams, and wood paneling. The results are spectacular. The homeâ€™s brick exterior is accentuated with white trim, including white ionic columns, railings, and balustrades supporting the stately, wide, covered veranda, which wraps from the front of the home to the Southside. The railings and balustrades extend to the second floor, creating a second balcony mirroring the first, and hugging a turret room, decoratively topped by railings. What catches the eye, though, are the sets of oversized, curved-pane glass windows that add movement and drama to the homeâ€™s curved exterior areas and sets this home apart from all others in Bozeman. Upon closer looks, one notices that even the exterior of the home has multiple details to define its elegance, such as the brick â€œropeâ€ around many of the windows and the stone lintels under the windows. The 5,915 square foot, 4 bedroom house is entered via the grand veranda and an imposing door that opens to the entry foyer. The foyer features a tall wainscot of wood paneling with an intricate overlaid design. A band of William Morris wallpaper highlights an oval stained glass window. The flooring, installed by the present owner, is honed marble in a basket weave design with a black honed marble edging. The foyer sets the tone for the entire home, which is classical, symmetrical and balanced. High ceilings with wood detailing, 10â€™ high doors, oak flooring, the wide entry opening between rooms, and ionic columns are part of the numerous design elements. The repetition of materials and motifs, along with the understated ornamental woodworking, the scale of the rooms, clarity of style, the harmony of materials, and natural light creates a timeless and soothing environment. The foyer connects to the front parlor, grand staircase to the upper floors, dining room, and family room. The house welcomes you with a sense of space and graciousness due in no small part to the overall openness, balance, and scale of the house. Tiger oak ionic columns and pillars, boxed-timbered coffered ceilings, high-set wainscot wood paneled walls, and an impressive staircase set behind 3 arched pillars create individual rooms while still being open like todayâ€™s great rooms. The stained glass windows in the staircase alcove leading to the second floor have been rumored to be original Tiffany glass. At the very least, they are from one of the artists who studied under Tiffany. The trio of windows diffuse the front parlor with an ethereal light. The eye-catching gas fireplace in what is now the dining room has a green ceramic glazed tile surround with a frame of tiger oak pillars and mantle. The curved-pane bank of windows in all three rooms create the feel of bay windows, expanding the rooms beyond normal dimensions. Kitchens are always gathering places and the brilliant updating of this kitchen began by taking the walls down to the studs and opening up the space. Todayâ€™s lifestyle is about families and friends coming together rather than back hall maids and cooks. Ken Ryder was the General Contractor, hired by the present owner, to complete this major project that involved modernizing the spaces while preserving the homeâ€™s integrity. The kitchen feels original even with its new counters, cabinets, appliances, plumbing, and a farm sink placed below the back porch window. Cabinets are a creamy off-white, there is a granite-topped island with bar sink, a Thermador 4-burner range and dishwasher, and SubZero refrigerator. The breakfast room, which adjoins the dining room, has a bank of four windows and woodworking that starts as a wainscot and wraps into shelving. A hallway from the breakfast room leads to the laundry room and a charming powder room that has a refitted toilette from 1896. The kitchen accesses a back â€œservantsâ€ staircase to the second floor. It also has a mudroom that connects to a back covered porch and the very spacious fenced yard with entertaining patio, perennial beds, and a lawn large enough for play. A second room off the mudroom it appropriate for an expanded pantry. The front staircase, with its magnificent windows, leads to the 2nd floor living quarters. The master bedroom, at the front of the home, has been created by the present owner. The spacious bedroom, with a walk-in closet, is quite special with its curved-paned glass windows. The newly-created master bath is styled in keeping with the home and includes a pedestal sink, honed marble flooring and shower tile in a basket weave motif, and radiant heat flooring. The former master bedroom, on the south side of the home, is now one of 3 other bedrooms on the second floor. It has its own ceramic tile and birdâ€™s eye maple surround fireplace, curved-paned glass windows, and a door to the upper floor balcony. The north side bedroom also has three curved-paned glass windows, intricate crown moldings with a pencil-width detailing to facilitate hanging art, wallpaper walls, original hardware on the solid birch doors, and plenty of space and natural light. The back bedroom is the former maidâ€™s room. These three bedrooms share a bath that has a pedestal sink, tile wainscoting walls, a tub, and a window supplying lots of natural light. The upper 3rd floor was originally the billiard room, with a call button to summon the maid, and three dormer windows, two of which have bay-windows. The large, airy and light space is ideal for a second master bedroom suite, and with this in mind, electrical and plumbing has been brought to the floor via an abandoned laundry chute and is ready to plug-in. The large room off the billiard room, presently used for storage, is ideal for a walk-in closet, a home office, or even a studio. The homeâ€™s basement, with its cement floor and the combination of stone and brick walls, is divided into different spaces including a large workroom, a space for pounding on drums, and storage. The windows are non-egress. The space is suitable to finish off into a home theater, gym, or any number of uses. The detached one car garage includes a very handy covered car port and a driveway that connects from Willson Avenue to the alley behind. This allows cars to drive straight through and not have to turn around in the parking area or back onto Willson Avenue. The roomy fenced backyard is very private considering its location. There is a brick entertaining patio, a treehouse, lawn, a walkway that goes around the home and the perennial flower beds, and a latched gate to the driveway and carport. The home had its â€œcoreâ€ of plumbing, electrical, master bedroom suite, and kitchen remodeled, updated, and modernized. However, the integrity of the home remains unchanged. The original radiators still supply hot water heat, but the first floor and master bath also has radiant heat flooring. The home now has 11 heating zones for energy efficiency. There is radon mitigation in place. The home has been core bonded for insulation, and electrical outlets have been added to rooms. It is move-in ready with its heart in-tact and ready for its 5th owner to enjoy and add to Bozemanâ€™s history. See the 725 S. Willson Avenue Listing HERE.